This paper gives the opportunities we have had in making disciples thru mostly nationals with much less cost than putting much money into short or long term American missionaries. It is what we have learned over the past thirty years. It is based on some evidence presented here and some presented in AndMakeDisciples.com. Opportunity Cost. Once the money is used for a short term American mission trip, it is not available to help national missionaries in more effective ways. Other possibilities for $3,000 include Childrens’ Bible Clubs for 2000 children for 10 days, 20 Proclamers to disciple 20 villages, or literacy training for 100 adults for one year. On page 33, Steve Corbett and Brian Fikkert go on to discuss the salary of local church planters being $1440 to $4320 a year in India while Americans may cost $36,000 to $72,000 a year. An American missionary overseas has to struggle to be effective compared to a Christian national with training. On top of all of this, the cost of funding an American missionary is exponentially higher than the cost to train a local Christian. Another missionary leader stated that “the best workers to recruit are people from the country where the people group lives.” He is referring to Unreached People Groups. Often the national knows the culture and language which costs a lot less than for an American to learn. 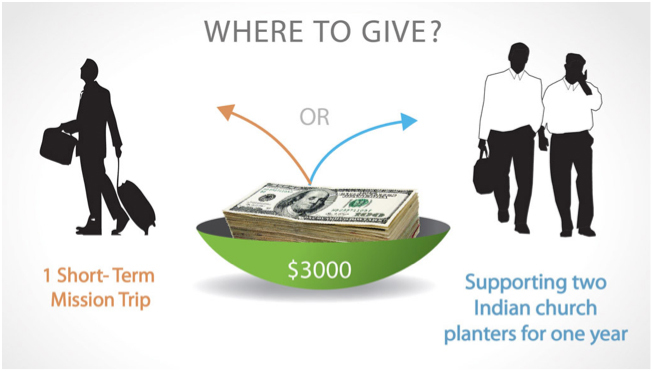 In Helping Without Hurting in Short Term Missions, the authors discuss opportunity costs “For every investment of our resources, whether time, money, or energy, there is something else we could have done with those resources instead.” For example, if one has a thousand dollars or a hundred thousand to give, once it is given for one cause, it is not available to give to another cause. The concepts of opportunity costs can apply to mission giving. Determine the goal or objective to achieve in giving. Determine the options or opportunities that could be used to achieve the goal or objective. Estimate the cost and potential returns from the main options available. This requires evaluation and study. Follow-up on the gift(s) given to try to determine what results were obtained. The process is then repeated and new options may be included to examine. Usually for best results, longer term investments and follow-up inspections and continued knowledge acquisition are required. Our past thirty years of learning and continued mission giving, can be broken up into these five steps with some explanations. About six years ago, I decided we should focus on India. We had been involved there for 25 years. There are many unreached people groups who have never heard the gospel with follow-up to make disciples. The Dalits and other lower caste were put down by their Hindu religion. They were open to a religion that gave them hope here on earth and for eternity. The cost to equip national Christians to spread the gospel was very low. Only 2% of Indians may be Christians. The opportunities to give to were many. These included television, radio, and tools to help an organization. We let the organizations we give to and believed to be effective, pick their own tools. A big question that arises is how to be accepted in an unreached people group. One could drill wells or have large social help programs. We have seen very low cost programs such as adult literacy and children’s clubs with their social benefits and learning about Christianity work very well. We believe the most important objective is their becoming disciples rather than their physical well-being. The physical part is important and mentioned often in the Bible. However, once people start becoming disciples, the money spent for alcohol and gambling is used for their own betterment. As a church develops, the members start helping each other including taking in orphans and the sick. We ended up focusing on five Indian church planting groups. We continue to spend some money on short term trips to evaluate these national ministries. We have paid another evaluator for four years, including two five week trips a year to India. We continue to do cross checking with others who have knowledge of the missions we support or are considering supporting. We also work with a few of the one million international students and many immigrants in America to introduce them to Christianity and disciple them. We can do follow-up easily which is not true of most so called ‘short term mission trips’. We also support a ministry to reach immigrants and refugees. Both of these groups bring the gospel back to their countries. From Charity Giving Season it is explained how “75 percent of all donors don’t do any research.” (4) before making a donation. Another source said 50 percent of business people, who one would think would take the time, do not do any research before giving. (1) Corbett, Steve & Fikkert. Brian Helping Without Hurting in Short Term Missions. 2014. Illinois. Moody Publishing. (2) Stravers, Dave. Measuring What Matters. 2012. Michigan. Mission India. (3) Rajendran, K. Page 373. Majority World Sending. Indian Sending. Perspectives. US Center for World Missions. 2009. California. William Carey Library.